What Can This Stock's Earnings Tell Us About Today's Housing Market? It can be challenging for investors to sift through the signal and the noise of the housing market. Here's what Lennar's most recent earnings tell us. Investors and noninvestors alike care immensely about the housing market. For many, a home is the largest financial decision they will make in their lifetime, and homeownership is much more prevalent than stock ownership. For investors, the housing market is a barometer of economic health that can help to shape investment theses both in and out of the housing industry. Like every other financial market, every aspect of the industry is examined under the microscope and tends to cause overreactions by pundits. Today, the prevailing narrative is that rising interest rates and high prices are pushing prospective buyers completely out of the market. If there is one thing we can count on, it's that the market will overreact to this news. That has been the case so far this year as the S&P Homebuilders Select Industry Index is down 21% year to date. Should investors be concerned about this decline? 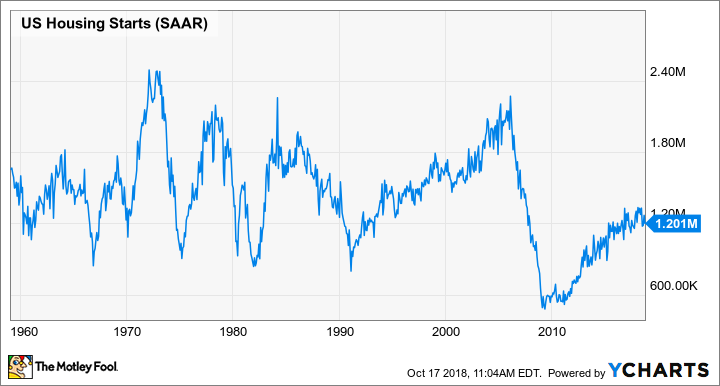 Let's take a look at the most recent earnings results from America's largest homebuilder by sales -- Lennar (NYSE:LEN) (NYSE:LEN-B) -- for a few takeaways about the housing market and homebuilding stocks. DATA SOURCE: LENNAR CORPORATION EARNINGS RELEASE. EPS = EARNINGS PER SHARE. When it comes to homebuilders, their revenue in any given quarter is relatively predictable because it is a reflection of the orders it took in prior quarters. This past one, Lennar's revenue was still on the rise because of the strong booking numbers it posted in the first and second quarter of the year. Keep in mind, too, that Lennar's results also reflect its acquisition of CalAtlantic in February as well as smaller, privately held WCI. So those year-over-year results are not all organic growth. Also, many of those sales it booked in the prior quarters came with high prices, and that is why we saw Lennar's average sales price pick up slightly from $405,000 in the second quarter to $415,000 in this past one. Data source: Lennar Corporation. Chart by author. Beyond Lennar's revenue numbers is where we start to see some of that housing slowdown. This past quarter, net new orders slid 12.6% compared to the prior quarter. In fact, the 12,319 new orders in the quarter were less than total deliveries, which means that its backlog declined on a unit basis. It may be too soon to say that we have seen the absolute top of the market. Homebuilding and selling homes do follow seasonal trends, where the spring and early summer are the high point of the buying season, and tend to wind down through the fall and winter months. Yes, there is a slowdown in the market right now, but that could be partly attributed to expected seasonal trends. Ever since the housing collapse a decade ago, the media seems to use a lot of hyperbole when viewing every housing metric. A change of a few points in critical measures like inventory levels can cause talking heads to proclaim the next great housing crisis. So let's take a step back and try to put some context to this. Is the market slowing down? Yes. Housing prices were ridiculously high, which started to push buyers out of the market. Also, rising interest rates mean that the maximum lending amount goes down, which puts some of these higher housing prices out of the reach of some buyers. These things are inevitably going to force the market to react with slower sales and lower prices. For Lennar and other homebuilders, that means gross margin contraction and slower sales rates. U.S. housing starts data by YCharts. At the same time, though, there are still some metrics working in the housing market's favor. Housing starts from 2009 to 2015 were well below long-term historical averages, which means that there is pent-up demand at the right price point. A majority of those buyers are millennials who put off buying for years because many weren't in a position to buy. Now that many are forming families, they are coming to the market. On Lennar's quarterly conference call, Chairman Stuart Miller mentioned that low unemployment and rising wages should help drive demand in the housing market for some time. But like any other market, it won't be linear growth. The housing market is going to go through fits and starts, but every dip isn't the next great housing collapse. There is a lot of pessimism baked into Lennar's and other homebuilders' stocks today, with most industry players valued between six and 14 times trailing-12-month earnings -- Lennar currently trades at 10 times earnings. Even if we see a slowdown in sales or some margin contraction from lower home prices and higher costs, these are extremely cheap prices that seem to be anticipating a massive market decline for homes. Based on that, homebuilders could be some great stocks for value investors to buy even if we see a slight market dip.